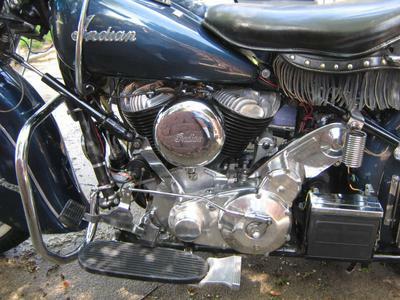 The 80ci 1950 Indian Chief Motorcycle for Sale won't be on the market for very long! The Chief comes with a sidecar with 2004 on sidecar body and frame. Check below to see a list of things done to the old Indian. I rode the Indian approximately 4,000 miles, then stored the motorcycle inside the house between 1985-2000. Then, I rode it another 3,500 miles until 2011 and after it got a new top end in 2011(the bottom end was tight with no issues or problems). It underwent a complete restoration in 1977 and got a new top and bottom. I put about 270 miles on the bike (the speedometer displays 7768 miles). It currently rides, runs and operates with no problems; it's simply a very dependable bike. Additional pictures of the restored 1950 Indian Chief are available upon request. and please refer to the list below that was mentioned earlier. Linkert Carburetor rebuilt by Tom Cotton of Liberty Motorcycle Specialties, Inc. The Indian has its oil pump pressure tested by KIWI Indian February 28, 2005. Jerry Greer's Engineering also ran a test on the oil pump in 2011. I made this decision when I did new top end in June 2011. An electronic Ignition Kit was installed that came from Stan Jessup. Krant vent from Jerry Greer's Engineering. Black painted electrostatic cylinders painted in 2011. Bearing assembly kit for clutch release throw-out-bearing from Jerry Greer's Engineering. Jerry Greer's engineering brake light switch. Jerry Greer's front brake bearing(ball), double row, shielded and lifetime lubricated. Push rod bushings, 25-T countershaft sprocket, pistons/rings replaced ( Eastern Motorcycle Parts). CHROMEAC Four O-ring valve covers - Starklite Cycle Parts. Jerry Greer's inner bushing generator sprocket shaft. Old Iron Designs LLC - oil filter kit. New, improved leak resistant Starklite Cycle Parts petcock. Shiny Pipes Indian Chief Exhaust Cover Ups. Starklite Cycle Parts clutch Pinion Gear 10-T, Pinion Gear 32-T Battery IGNRATCHEAC, Kickstarter Crank. American Indian Specialists rebuilt distributer. 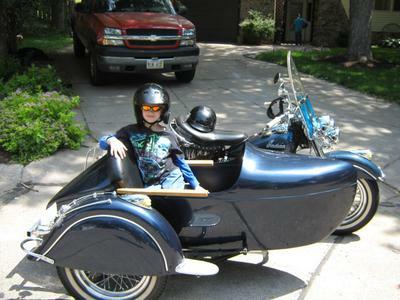 The motorcycle sidecar got a new paint job in 2002. New 4 row primary chain and new rings installed in 2011. Has 12 V system electric starter; installed relay 2011. Replaced all cam follower rollers and bushings for cam follower valve lift shafts. 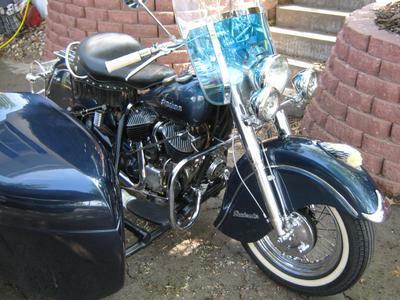 The 1950 Indian Chief Motorcycle for Sale is in Omaha, NE Nebraska USA and runs and operates. It could use a new battery but I'm not adding a replacement so that the new owner can install the battery of his or her choice. 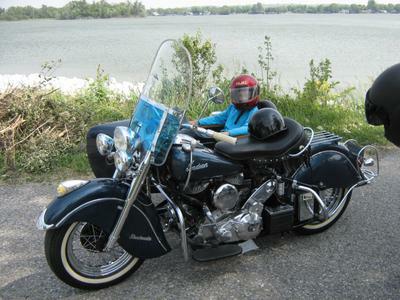 This has been a one-owner vintage Indian motorcycle from 1962-2011. Both the motorcycle and the sidecar are being sold in "AS IS" condition. The Chief is in great running condition. with no implied warranty and no returns. The buyer is responsible for pickup in Florida and if the buyer chooses to have the bike shipped, all cost are the buyer's responsibility. Email me using the address I have provided in the comments section with any questions or to make arrangements if you want to buy the Indian using the you can reach me by e-mail using the comments form found directly below this classified provided by GoGoCycles Used Indian Motorcycles for Sale. I am willing to fly down if the price is right. What is the cash price special today if I may ask? How can I get a hold of you to discuss bike/sidecar price, etc...? Wondering if you still have Indian for sale? Join in and write your own page! It's easy to do. How? Simply click here to return to INDIAN CHIEF Ads.